A dove release is a fun, dramatic, and even emotional component of some wedding ceremonies. 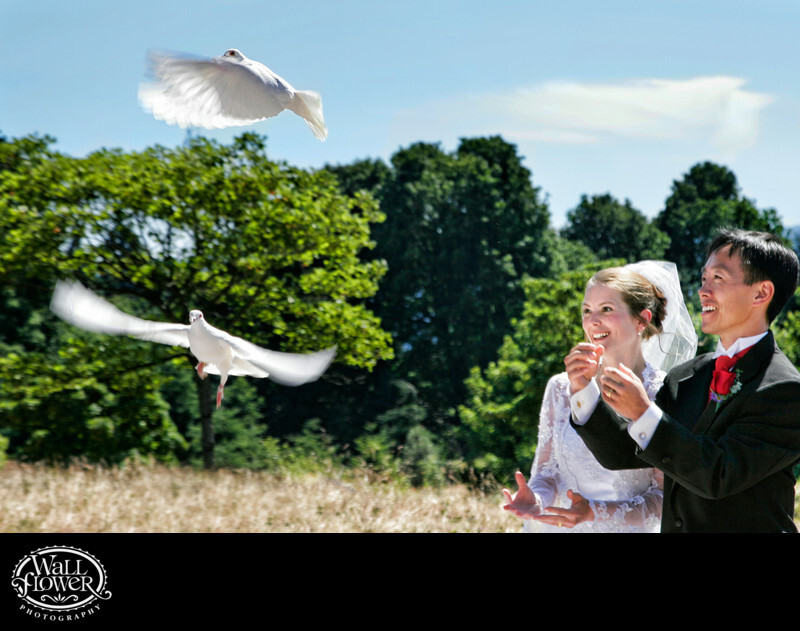 At this wedding in Volunteer Park in Seattle, Washington, the bride and groom were carefully handed these completely calm birds, which they held for a few minutes while the officiant talked about the significance of the dove release. Then, as soon as they opened their hands, the doves suddenly burst into flight, and were off in the blink of an eye. It happens so fast, us photographers have to be ready and react quickly to properly capture the moment. It helps to have cameras that can fire as many times per second as ours can! I love the combination of sharpness with a bit of motion blur on those fast-moving wings, and the bride and grooms's smiles as they watch the birds fly away. This is an award-winning photo in the Ceremony category of a 2006 wedding photography competition held by the Wedding Photojournalist Association (WPJA).